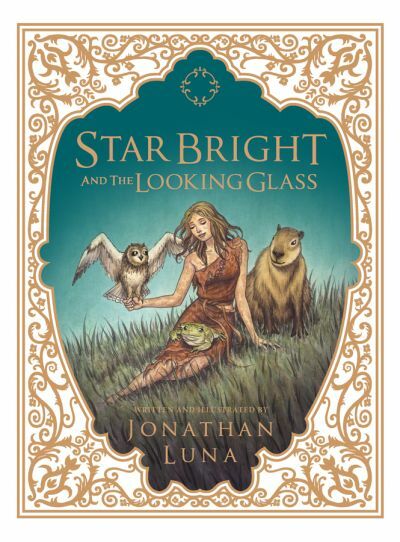 STAR BRIGHT AND THE LOOKING GLASS is Jonathan Luna‘s first solo creator-owned work after wrapping up THE SWORD (with brother Joshua Luna). In STAR BRIGHT, to be published in November by Image Comics, Luna departs from his superhero and science fiction comics, and works in the dreamy, fantasy-tinged aesthetic of his fine artwork to create a tale of beauty, vanity, and friendship. The end result was STAR BRIGHT AND THE LOOKING GLASS, which tells the story of a wild young woman who discovers her own beauty when she finds a mirror in her forest home. The awakening of Star Bright’s consciousness of her own loveliness also opens her heart to vanity. But when a wicked sorceress steals Star Bright’s beauty Star Bright will learn from her woodland animal friends what the true virtues in life are. Image Comics Publisher Eric Stephenson lauded Luna’s dedication to growing as an artist. Luna talked to Comic Book Resources about his new storybook on July 30. STAR BRIGHT is a 72-page 9 x 12” hardcover storybook with full-color artwork for all ages. It will be in stores in November and available for pre-order in the September issue of Previews.